Lonely at the Big Top, a photo by Little Piggies on Flickr. Is it just me or is Halloween becoming a bigger and bigger event every year? I'm not complaining, I just find it fascinating how the shops are full with people shopping for pumpkins and spooky party accessories. The costumes are getting more and more elaborate as well. My daughter is excited about it being Halloween tomorrow but I'm not really sure why. I said we'd eat Halloween chocolates and make a spider cake though so I guess that's reason for a four year old to celebrate! I've never taken part in trick or treating and always hope that no one will knock on my door demanding whatever it is kids demand at Halloween these days. I do however like the idea of doing organised trick or treating where are all the neighbours get together and decide which houses are going to take part. 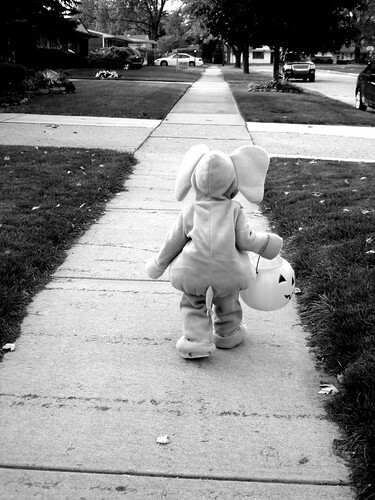 This is such a cute trick or treating photo. Nothing scary about this costume by the looks of it. I hope the little one got a huge bucket full of goodies!